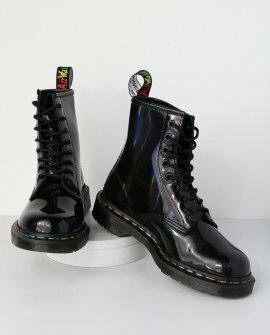 You can't get more OG than the Dr. Martens 1460 Pascal Black Rainbow Iridescent 8-Eye Boots! 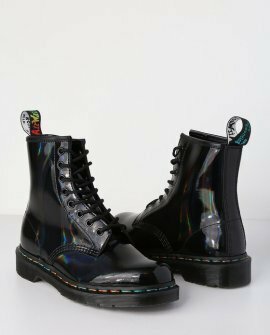 Patent vegan leather finished with a subtle iridescent rainbow sheen shapes the classic 1460 pascal design with a rounded toe, 8-eye lace-up upper, and gunmetal hardware. Chunky, air-cushioned sole with rainbow stitching and no-slip finish. 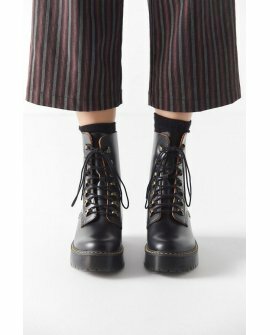 Branded pull tab loop at back. Available in whole sized only.